A simple looping back-and-forth motion is all you need to make a feather design on your quilt. 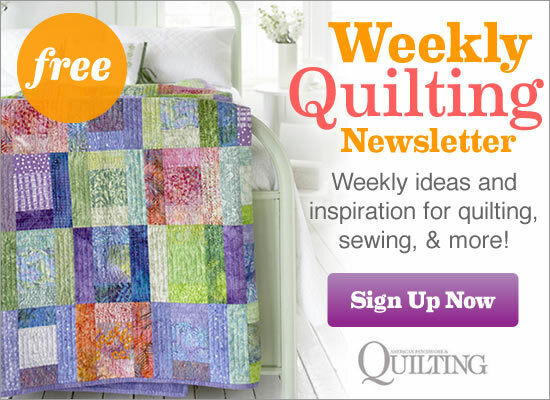 Browse our gallery of feather quilting designs for ideas and tips from our machine-quilters. To visually connect the light print block backgrounds, Handi Quilter educators Marie Eldredge and Angie Balling machine-quilted continuous designs of feathers in the light blue print and metallic gold swirls (which pick up on the metallic accents in the fabric) in the white and tan prints. Handi Quilter educator Marie Eldredge machine-quilted a cluster of feathers over each circular motif in the outer border. She highlighted the large triangles and small cream triangles in each Lost Ship block with simpler feathers and connected the triangles with stitched arcs. Feathers are a popular quilting motif. We give tips for getting the perfect feather shape and troubleshooting once you are quilting the design. Shelly Pagliai machine-quilted a pattern of horizontal zigzags across the quilt top. She stitched a feathered vine inside the wide rows and filled some narrow rows with circles or wavy lines. Natalia Bonner machine-quilted feathered wreaths in the areas outlined by the red, pink, or orange print chains. Cathy Peters and Lynn Graham machine-quilted a feathered wreath in each block center and filled in the block backgrounds with a small diagonal grid. They stitched a cable design in the sashing rectangles and added a larger diagonal grid in the setting and corner triangles. Kaylene Parry machine-quilted small- and large-scale feather designs in the blocks and borders. She stitched a teardrop vine in the sashing strips and a floral motif in each sashing square. Diane Nagle stitched a variety of feather designs in a circle in each block and in a straight line in each sashing unit.